Description of the words. Sharing with your family and friends words and labels like This is a quilt that I made because you are special! Keep it close and know I am with you always! To:______ From:______ Made especially for you! (OR) Handmade by:____Dated:_______ (OR) This is made especially for you! To:_______ From:_____ (OR) Handmade with Love To:______ From:_______ Date:_____ (OR) This is made especially for you! With love (OR) Sewn with Love (OR) This quilt is made for you! (OR) From one crazy quilter to another! (OR) These are the shirts I used to wear, when you hold this, remember I am there. (OR) This is made for you to make you smile and feel good! To: ______ From:_______ (OR) We share... We Do our best... We have lots of fun... We keep our promises... Just because! AND a couple of blank ones with pictures to sign your own label. Basic Instructions: 1/ Press. 2/ Cut strip off, cutting vertically down right side. 3/ Cut on dotted lines to make 12 (5”) blocks. 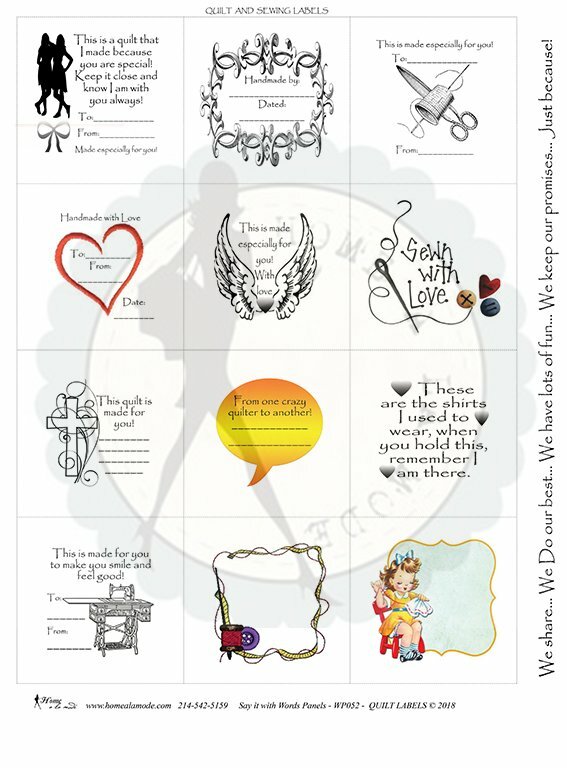 Add them to your back or front of your quilt!